Welcome to a peek inside my Real Food Freezer. Y’all, aren’t freezers just the best invention ever? Without my freezer I wouldn’t have pineapple in my smoothies in January. Nor would I be able to stock up on healthy meats when I find a good sale. While I love my freezer, I’ll admit, unless I keep it organized, it becomes a food wasteland. You’ve had that moment, haven’t you? Where you pull out the unidentifiable frozen mass from the back and wondered: What is this? How long has it been in here? To that end, I’ve become selective on what I allow in my freezer and how I freeze it. Before you peek inside my freezer, I’ll share with you my freezer rules. Rule #1 – Cool food completely before freezing. Rule #2 – Use glass containers but never fill them all the way. When you freeze in glass, you need to leave about 1/2 inch head space to make room for expansion. Rule #3 – Use containers that are just the right size for what you want to freeze. Leaving any additional room can lead to freezer burn. Rule #4 – Label, Label, Label. You need to know what you’ve frozen and when you froze it. I do an easy meal prep about once a week. Here you are looking at freezer pasta salad, a freezer smoothie ready to be blended, homemade French bread and in the back you’ll see I store all my flour in the freezer. I also keep sauces and soups in the freezer. Here I’ve got pasta sauce and lentil soup. In the container with the green lid I have dark chocolate dipped frozen bananas. Such a yummy real food treat! I always keep frozen organic berries from Costco in my freezer. So much cheaper than fresh! In my drawers, I store the meat I buy in bulk from Costco. Finally, do you know you need to keep nuts in the freezer? I transfer them from bags to jars and store them in the door. 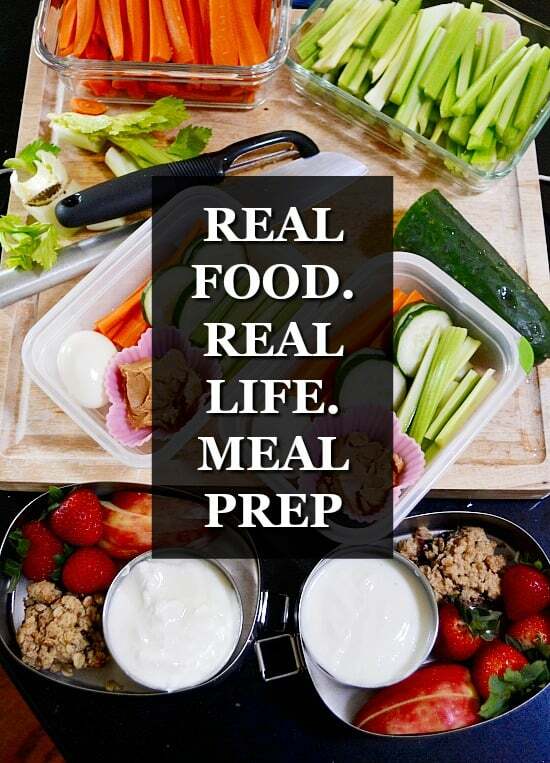 To get the recipes for the Smoothie Packs, Chocolate Dipped Bananas, or Lentil Soup Sign-Up for the 4 Week Real Food Prep Plan. In 2017 I hope to make more real life videos. Unedited looks inside my life. If this appeals to you, would you let me know? Maybe leave a comment? Perhaps leave what you might like to see a video on?